Order Now For Super Low Pricing! A fast and easy way to clean knives and utensils after cooking, but also an everyday time saver for those without a dishwasher. A large suction cup on the back allows for attachment to your sink, and the lasting bond will keep it ready for action, whenever you need it. The durable plastic shell is completely lined with bristles on both sides, and they are the perfect length to give full coverage without preventing movement. The nylon material provides a scratch-proof scrubber that removes food in a matter of seconds, and the flexible material is both powerful and gentle, so you can use it with confidence on any utensil without worry of scratching or damage. 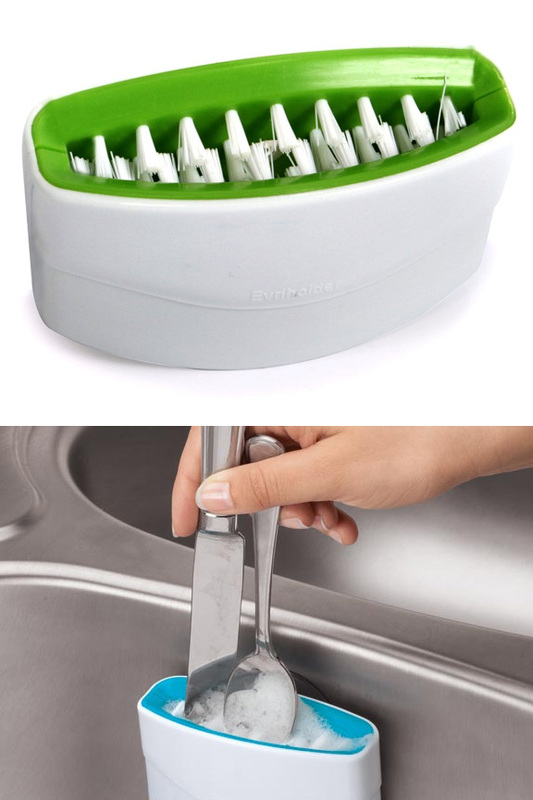 It can be used to wash a single knife after chopping vegetables, or several pieces of silverware all at the same time. Just add a bit of soap and water, and then press through and pull up to scrub things clean. It works way better than a sponge or scrub pad, and allows you to touch less of the yucky stuff while working. High quality materials ensure it will be useful and effective for a long time, even with everyday use. Time Saver. Washing stuff by hand can take forever. This tool multiplies your effort to allow you to finish sooner. Versatile. Wash one knife, or wash three spoons. The wide opening and adaptive interior mean you can use it with many shapes and sizes of utensils. It also makes it easy to wash several pieces at once. Always There. No digging under the sink, or running to the cupboard because this scrubber will be right there when you need it. Strong suction keeps it right on your sink, and prevents it from moving as you wash. Easy-To-Use. It could not be more simple, but that does not decrease effectiveness. Anyone can make silverware and knives sparkle when using this tool. High Quality. Durable materials and quality construction mean that this product will work well, and last through tons of use. Speed and efficiency are the name of the game. Stop wasting time and effort with rags, sponges and brushes, and get your cutlery and other utensils cleaner than ever. Powerful bristles pack the interior and overlap for maximum coverage. Just plunge down to quickly remove caked on food and other grime with the gentle cleaning action. Use with a single item or several, and follow the instructions below for best results. For best results, attach to side of sink using the suction cup. It can also be used as a hand-held tool, but it's designed to secure in place and be ready when you need it. For a strong bond, make sure sink and cup are both clean and dry. Press firmly in place to secure. Drizzle dish soap over the top of the bristles. Wet cutlery and other utensils, and then push down through the bristles to wash. Use a quick up and down motion to thoroughly clean, and remove stuck food. Wash one at a time, or work with several at once. Hand washing is recommended when dirty, but to accomplish this easily, simply add soap and let water run through the bristles until clear. 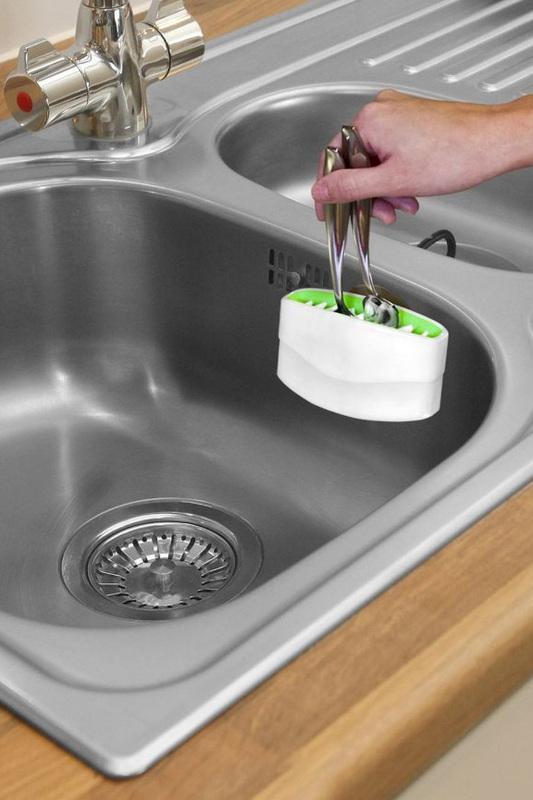 Uses A fast and easy way to scrub and wash silverware, knives and other cooking tools. Mount to the side of your sink to keep it accessible. Compatibility Works with anything that fits inside. Color White with green or blue. Capacity Easily accommodates several items at once. Wash several pieces at the same time. Hole Size & Bristle length 1" x 3.5" opening with .65" bristles on both sides that overlap. Hand washing made easy. Whether you wash one or several items, this tool can save you time and do a better job. Quickly scrub clean knives, forks, spoons and more. Order Yours Today! This is the best silverware scrubber ever... Everyone who has used it loves it in fact I bought one for every household in my family! Works great, Cuts my dish washing time by 1/3. Love it! This works great! Very helpful when doing the dishes! I could not wait to receive this handy little gadget. I am 50 years old and have only had the use of one arm for 30 of those years. I have always found a way, but I have certainly had my fair share of struggles. I do not have a dishwasher and actually enjoy washing dishes by hand. Something about the warm water and cleaning that soothes my soul...except silverware! Hence my excitement for the cutlery cleaner. I used it 3 days and it came apart. Yes, I'm aware it comes apart for cleaning, and I put it back together. My husband and my father both put it back together after the umpteenth time it came apart. Will not stay together for more than one piece of silverware. Soooo disappointed! The cutlery cleaner makes the cleaning of eating utensils so much easier. I purchased several and have given to family and friends knowing they'd appreciate them as much as I do. I ordered these for my daughters for Christmas. They are very pleased with them. Loved this little helper.. Always clean my dishes before putting in dishwasher. Silverware use to take too long to get sticky stuff and dried stuff off, but no more. Go ahead and spread that peanut butter, I have a quick helper now. The item itself works great, the only problem I see is that there should have been two suction cups so that the unit would stay in place and not tilt and turn when using it. I actually fixed the problem with velcro. Where have these been all my life??? These are amazing and I love them so much I am going to order more for my family and friends. Fantastic gadget! It does what's it's supposed to as long as you hold the unit itself in your hand. There is just one suction cup at the back and although the suction is strong, it's attachment to the unit is flimsy. You can't just stick it to the sink and use it. It's too wobbly and you can't scrub properly. If you hold the unit then scrub, it works better but then it's pretty much the same as using a sponge or something to clean. this little cleaner does work, however you have to hold the basic scrubber thingy in place. It moves a lot from the suction attachment so doesn't really stay in place when used unless you hold it steady. Works great, especially does a good job on all sized forks! What a great idea to clean all that cutlery I hate washing. It works really well. I do let the cutlery soak and clean them last. The only thing I have found that doesn't clean instantly are peanut butter coated spoons. I haven't had any problems with the suction cup holding, however, it does tend to turn a little sideways at times. Would be nice to have two suction cups on the back to keep it straight. This doesn't happen often, so it really hasn't bothered me. Requires two hands to use, which means putting the sponge down while doing dishes, doesn't save time. Bristles are too firm and I end up inadvertently pulling it off the sink wall with the utensil I'm trying to clean. Cool concept, poor execution. Would function better as a handheld tool as opposed to being poorly suction-cupped to the sink wall. make it smaller and handheld or put two suction cups so it doesn't swivel around so much. Keep working on it. Good Product, especially given the price. Genius idea. Works great, especially on peanut butter-covered knives and spoons! For spoons and forks, you sometimes have to hold the device in place as the single suction cup can cause it to pivot with the scrubbing motion. If it had two suction cups or somehow held its position more steadily, it would be perfect! Either way, well worth the price!!! I was very excited about this item however it wobbles a lot. It will not stay in one place as you are cleaning silverware so you literally have to hold it with one hand while cleaning the silverware with the other. I am giving this item 3 stars because it was definitely affordable and I still enjoy using it. It would be great if the company came up with an innovative solution to the wobbliness because this item has the potential to be wonderful. I've never liked washing silverware...BUT! I have never been one to enjoy washing silverware and other kitchen utensils, however, this device makes it much more bearable! It only takes a couple of passes through and everything comes out clean! Like it, but the suction cup does not hold the brush stable. I love my new cutlery cleaner from simplygoodstuff.com it makes doing the tedious duties of washing utencils so much easier. The only thing I would suggest is modifying the design to stabilize it. If I don't put the utencils directly in the middle, its not as effective. But even so, I still love it! I really like the cutlery cleaner. I have it attached to my sink. I run all my silverware through it before it goes into the dishwasher. There is nothing left on them! Awesome product. I really like the cutlery cleaner, it helps with the dishes. It is all they said it was. Great buy! I love it. Love it. My husband lost use of his right side due to a stroke. I purchased two...one for the kitchen...the second he uses to wash his glasses,etc. Great idea. After just a few days use the bristles are not holding up as well as I thought they would. Overall I have enjoyed using it and it is handy and easy to clean. The product is good, BUT wish it would not turn while using it!! Love it!!! No more rice stuck to my spoons after the dishwasher, woohoo!!! I really like the product, but the suction cup needs to be redone. It doesn't hold the weight of the scrubber and twists all over when in use. I find myself having to hold the scrubber (defeating the purpose of why I bought the product. Great product, does a great job cleaning off stuck on food. Great quality product. Will continue to buy more in the future. I like this product. Performs the way it is intended. I use it on a regular basis. Really pretty useless. Great concept but the suction cup was not strong enough to hold it on the sink. Even when I held it in one hand and cleaned with the other, I ended up cleaning them twice. It's a cool concept, but it doesn't stick very well to the side if the sink. It slides around while you're trying to scrub. It's cool though. Cutlery Cleaner a great idea! Love it except the suction cup doesn't keep it steady. I added scotch outdoor tape to secure it better- my silverware has never been so clean! The idea for the product overall was a great one. This one could use some minor tweaks and it would be way better. First since there is only the one suction cup on the back it likes to turn when your using it. Also the internal plastic piece (the green or blue part) slides out of it on occasion, it's easy to put back but makes me wonder good of quality the product is. I love this product! It makes washing utensils so much easier and faster! My only criticism is that it kind of rotates around the suction cup. It would have been better if it had two smaller suction cups instead of one big one to hold it in place a bit better. Not a big deal though. Is the bottom open to accommodate long knives, etc? Yes. The bottom looks just like the top, and is totally open, so water, soap and large cutlery pass right through. 27 of 28 Customer(s) found this Answer helpful. How do you clean it? Does it come apart so you can clean the bristles? Didn't see anything in the write up or reviews regarding cleaning. It does not come apart for cleaning. It's recommended to add soap and rinse under the faucet for cleaning. It's only nylon bristles on the inside, so it does not get dirty easily, and most stuff you wash from your cutlery rinses down the drain without sticking. 11 of 12 Customer(s) found this Answer helpful. Can I get this in the blue one shown in the picture? Stock is random at this time, so we are not able to offer a color choice when you add to cart. If you prefer one color over the other, just let us know by using the comments box at checkout. If the color you want is in the warehouse when your order ships, we will definitely honor your request. Can you toss it in the dish washer for a deep cleaning? It's not officially recommended, and we haven't actually tested it, but it would probably be fine on the top rack. It does have a plastic shell that could potentially melt under high heat, and there is a slight possibility that water could get inside the shell to cause long term problems. These are unlikely based upon the intended use and design, but automatic washing conditions can be a bit more severe. Hand washing will most likely ensure a longer life, but if you give the dishwasher a try, be sure to post your results back here to let everyone know. We will do the same. does it come in red, gray, black or white? I definitely don't want green or blue. It's mostly white with an accent color. The only two choices at this time are blue or green. What happens when I want to remove it from my sink? Will it damage my fireclay sink's finish? No. It will not cause damage or leave any residue. When you want to take it off, simply release the suction, and it will lift off and leave no sign that it was there. Why is it necessary to purchase one of these when a standard washing up brush do exactly the same only better, and cheaper? It's not necessary, but it is useful. You can certainly wash one side at a time with a regular brush, and your silverware will probably be just as clean. Many people get this to save time and effort when hand washing dishes, while others just like fun new accessories for their kitchen. Can the suction cup be replaced? The reviews mention the faulty suction cup, and IF it could be replaced with a quality suction cup, I'd consider purchasing a few of these. I'm sure suction cups don't last forever, that would be the first part to become ineffective anyway. The suction cup is actually high quality, and it sticks quite well. Some people wish there were two, while others wish there was a robot inside to do the dishes for them. If you did want to replace the suction cup for some reason, it would be possible though. It can be pulled out with enough effort.